Thanksgiving is over. Today is the day full of dishes to do because everyone was too tired after a day of napping and football cheering! Today is a day full of rituals, too. Is it crazy shopping, movie watching or more football for your family? It is movies for us. The cohesive family unit we were yesterday is divided today, girls to one movie, guys to another! Most importantly, today is the day to start eating those leftovers. I have already enjoyed my turkey, brie, cranberry and spinach Panini. Now I am thinking dinner. How quickly I forgot that just yesterday I swore I would never eat again!! 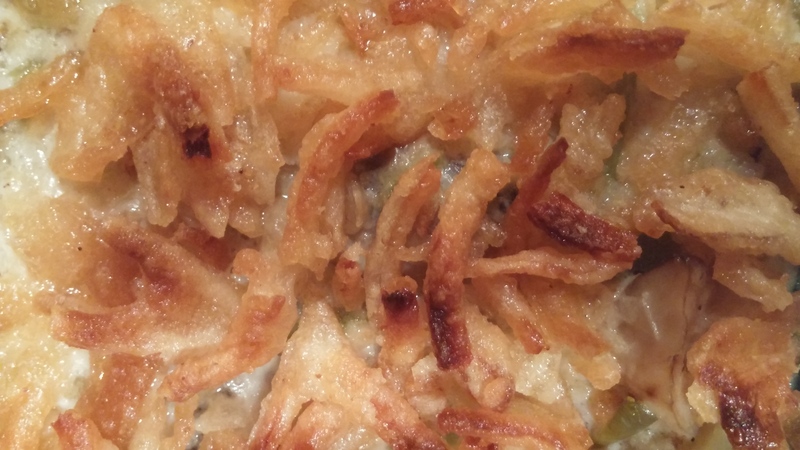 Green Bean casserole, a classic on the table since Campbell’s introduced it in 1955! (It’s also tasty with green peas) Your either a lover or a hater, not much wiggle room. 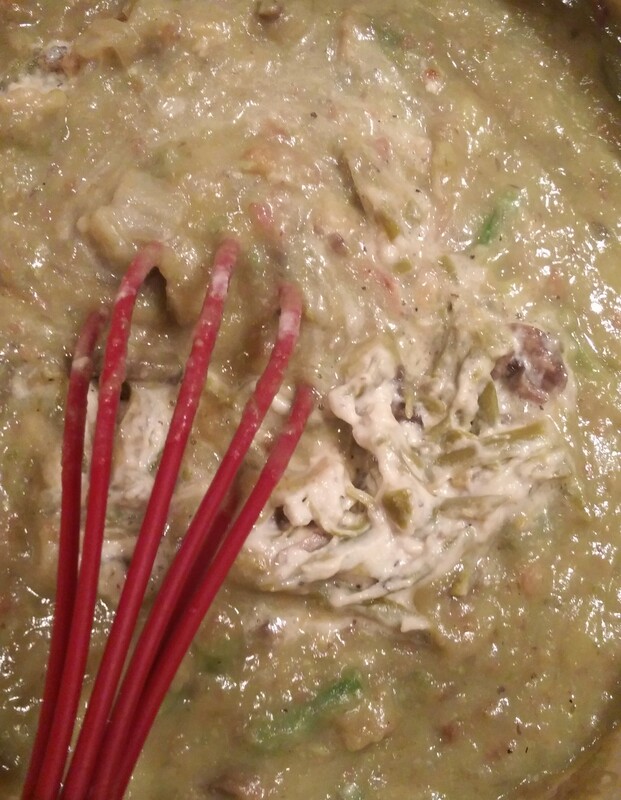 Green Bean Casserole, it is a dish that those who don’t usually eat great beans actually eat them and why not? They are covered in cream and fried onion rings! Do you have some mashed potatoes leftover? Great, set them aside. If not, you can use one potato (cubed) or a few new potatoes. I happen to have a few new potatoes that didn’t make it into the pot for mashed potatoes. So I quarter the new potatoes and put them in a pot and cover with water and add in the handful of onions. If you have some leftover chicken broth add it to the water for more flavor and bring to a boil. Take some fresh green beans (those fresh frozen ones in your freezer!) and add to the pot. 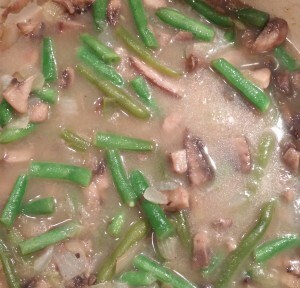 Add some more water/broth if needed to cover green beans. Return to a boil and reduce heat and simmer on medium for about 10 minutes or until potatoes are soft. 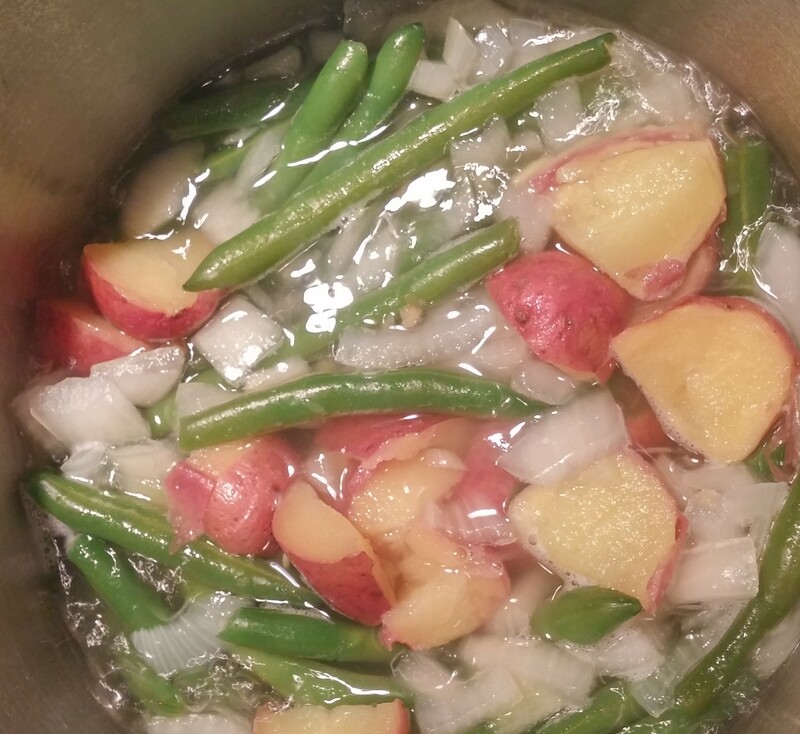 Remove some of the green beans with a slotted spoon and set aside. This is optional. I personally like to have more texture when eating a cream soup, so I remove about 1 cup of green beans to add back into the pot later. Prefer a smoother soup, just leave all the green beans in the water/broth. Go ahead and marry (like that term!) 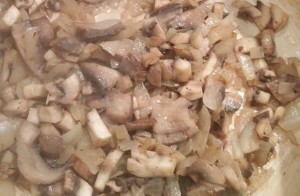 your green bean/potato mixture with all the water/broth to the mushroom and onion mixture or if you’re not a romantic, simply add the two together! Next, we will puree the mixture. If using a blender, please let mixture cool before pouring in for safety purposes. If you have a hand blender with splatter guard (recommended) mix in the pot. Puree until smooth. Think about split pea soup! We just made a vegetable puree…and you thought you couldn’t cook! It is my favorite way to thicken a soup. It not only adds flavor but also cuts down on the amount of cream needed for a cream soup. The only cream in this soup is what is leftover in the casserole. Have those mashed potatoes? Whisk in about a serving spoon’s worth and the 1/2 cup leftover green bean casserole. Then add some chopped ham or turkey. If you saved that cup of green beans like me, add them now, too. Heat over low heat for 10 -15 minutes or until hot. If you prefer a thinner soup, simply add some milk or cream during the last 5 minutes. 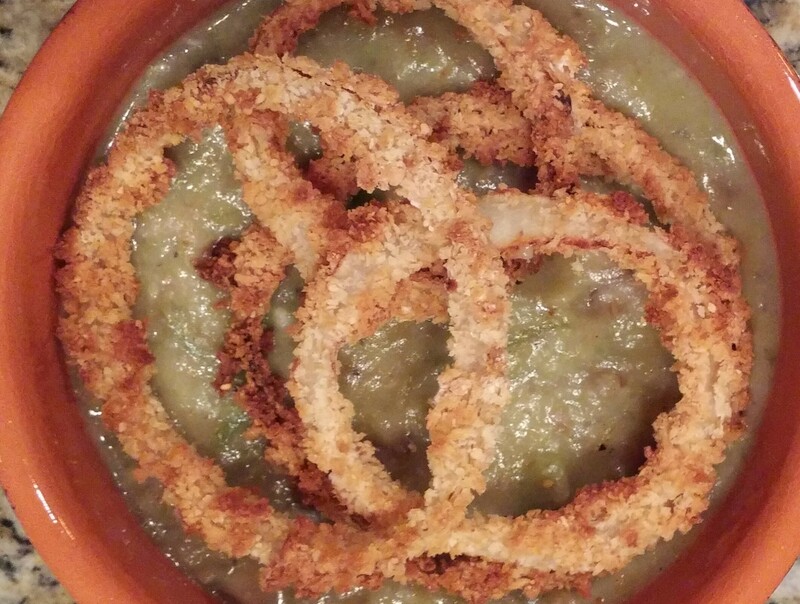 I’m sure most would agree the best part of Green Bean Casserole is the French Fried Onion Rings! I don’t know about you, but once the top is popped, everyone who is in or near the kitchen wants to munch on some. This is a ritual, in fact, I always buy a couple of containers, one for topping and one for snacking. I’m actually surprised my family ends up having as much on the casserole as we do! Do you have some leftover? Lucky for you, your soup is done, top with some onions and enjoy. 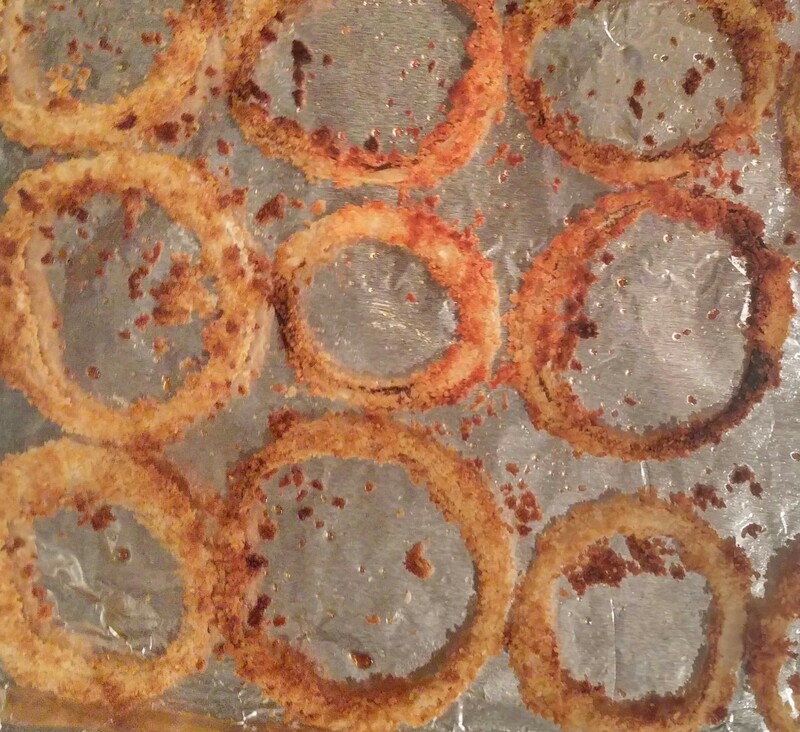 If not, let’s make some “oven” fried onion rings for our soup. 3 steps-1-flour; 2-wet; 3-coat (My crazy way to remember the order is a “flower”, that I water, to wear on my coat!) I said it was crazy, but it’s an easy way for me to remember. Think of one you can remember! 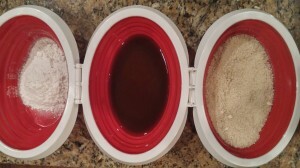 A breading station should be 3 separate containers. The first stop is flour. Do not miss an opportunity to season the flour. I am using Cajun seasoning. The second stop is wet. This is another opportunity to add flavor. This step is often egg or egg wash (with water or milk). I happen to have some beef broth leftover. It is a great way to add flavor to the onions-think French onion soup! The third stop is coating. I have some Panko crumbs (gives a crispier coating than breadcrumbs, but breadcrumbs are fine to use) seasoned with Parmesan cheese. Simply dredge the onion rings in flour, shake off excess, dip in broth, let excess drip, then into crumbs. Coating both sides. Place on a cookie sheet lined with foil sprayed with non-stick spray (or olive oil spray) in a single layer. Then spray the tops. 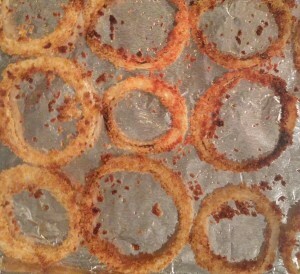 We are going to “oven fry” the rings. Bake for 10 minutes, flip with tongs, bake another 10 minutes. Make extra for snacking!! Put your TO COOK IS TO CREATE thinking cap on: What other casseroles could you use like this for a soup? Think about the components of the casserole and use that as a building block. Broccoli casserole is a good one. Whatever is your main vegetable, use that for your puree. What other liquids could you use in the water? White wine is a good one, the alcohol cooks out but leaves a nice flavor. 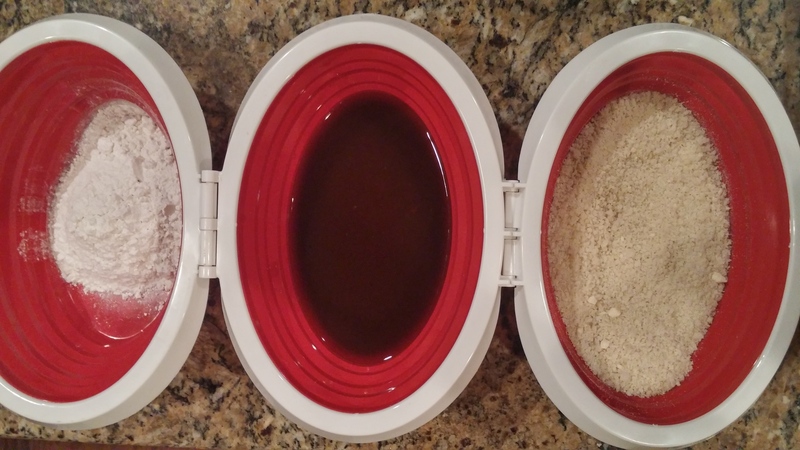 What other ingredients and seasonings could you use in the breading station for the onion rings? For example, another option is some cinnamon in the flour, apple juice or apple cider, and crushed pecans in the Panko crumbs. Great option for squash soup! FOOD FUN: I am a believer of getting your family and friends involved in the cooking process. A breading station is a fun one. It is also a safe option for younger children to do. Get your family or friends together and work it like an assembly line with a row of “helpers”. Have a lot of help, make a two-sided line! It may slow the process down, but it is sure to enlighten your kitchen! After all, it is the time for family, friends, and fellowship! Make sure you tell your “workers” how much you appreciate having them in your life! 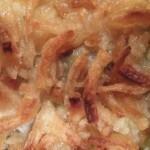 What a yummy way to use leftover green bean casserole! Sure does look delicious. With all of those flavorings, it HAS to be so good.